Shady Grove Fertility continues its educational series by inviting current patients and information-seekers to participate in complimentary virtual webinars and in-person seminars throughout Maryland, Pennsylvania, Virginia, and Washington, D.C.
Shady Grove Fertility, the largest U.S. fertility center, with more babies born than any other center in the nation, remains committed to educating the community and spreading awareness to individuals and couples about infertility through its ongoing educational series. Physician experts and other program specialists from the practice will host in-person seminars and online webinars that offer valuable insight and information for current patients, new patients, and information-seekers. Topics range from infertility basics, diagnosing infertility, treatment options, success rates, financial programs, and more. Adding to the educational value of each event, each concludes with an open question-and-answer session. “We understand the sensitive nature of infertility, therefore our webinars offer the opportunity to anonymously interact with a fertility specialist and gain valuable information needed to make more informed decisions,” says Lauren Roth, M.D., of Shady Grove Fertility’s Harrisburg, PA and Frederick, MD offices, who will be hosting the ‘What to Expect When You’re Not Expecting’ seminar on September 14. “The goal of the events is to raise awareness about infertility, which affects one in eight couples of reproductive age. Given the time-sensitive nature of fertility, I hear from many of my patients that they wish they had known their options sooner and wish they were afforded the opportunity to ask questions of an actual physician versus turning to the internet for answers,” says Stephen Greenhouse, M.D., of Shady Grove Fertility’s Fair Oaks, VA and Haymarket, VA offices, who will be hosting the ‘I need to see a fertility specialist...now what?’ webinar on September 28. Due to the rising demand of egg freezing—a program at SGF that has grown by 83 percent since 2013—one of the new features of the egg freezing seminars will be an introduction to SGF’s new egg freezing financial program, which includes payments as low as $195/month. The new package offers women a discount and includes long-term egg storage. For women who thaw and use their eggs early, they will receive money back. “What most people don’t realize is that a woman’s age is the number one factor that affects reproductive potential. Egg freezing offers women many advantages, mostly by putting time on their side. Initial fertility testing, which is very simple, provides answers and informs the conversation we as physicians can have with women about their best options to have a baby in the future,” says Stephanie Beall, of Shady Grove Fertility’s Columbia, MD and Towson, MD offices, who will be hosting the Egg Freezing seminar on September 13 in Towson, MD. New to the schedule and in honor of September being National PCOS Awareness Month, Shady Grove Fertility’s Wellness Center nutritionist, Meghan Sylvester RDN, LDN, will host a webinar specifically about nutrition for PCOS. Attendees will learn how healthy food choices and positive lifestyle habits can help women manage their PCOS. The webinar will also cover how healthy food choices can help you stabilize blood sugar and insulin levels and reduce carb cravings; why complex carbohydrates are important, meal planning tips for following a PCOS-friendly, balanced diet, how physical activity can help manage PCOS symptoms, and a supplements review. Following the presentation, Ms. Sylvester will host a live question and answer session with viewers. This free, informative webinar is on Tuesday, September 12, at 12:00 p.m. EST. 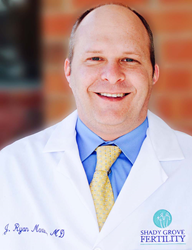 One of the most popular webinar topics that SGF offers is “What Your Menstrual Cycle Says about Your Fertility,” which in September will be hosted by Dr. Ryan Martin of SGF’s Bala Cynwyd, PA office. Many women remain unaware of what is normal vs. abnormal when it comes to their menstrual cycle. This webinar aims to shed light on this topic and help provide valuable information so that women who are trying to conceive know exactly what signs to look for that could signal the need to see a fertility specialist. “We are proud to be able to offer our community the opportunity to learn more about their infertility options. I look forward to meeting new patients at our events, and offer them reassurance that SGF is a unique place that has treatment options available to help almost everyone conceive,” says Dr. Martin. While all SGF in-person and online events are complimentary, interested parties must register to attend by visiting the Shady Grove Fertility calendar of events. Shady Grove Fertility is a leading fertility and IVF center of excellence offering patients individualized care, innovative financial options, and pregnancy rates among the highest of all national centers. 2017 commemorates more than 25 years of Shady Grove Fertility providing medical and service excellence to patients from all 50 states and 35 countries around the world, including its newest expansion to Santiago, Chile in July 2017. Today, with 41 physicians supported by a highly specialized team of more than 750 Ph.D. scientists, geneticists, and staff caring for patients in 28 offices throughout Maryland, Pennsylvania, Virginia, Georgia, and Washington, D.C., we celebrate over 40,000 babies born—more than any other center in the United States. Shady Grove Fertility physicians actively train residents and reproductive endocrinology fellows and invest in continuous clinical research and education to advance the field of reproductive medicine through numerous academic appointments and partnerships such as Georgetown Medical School, Walter Reed National Military Medical Center, the University of Maryland, and the National Institutes of Health. Nearly 2,000 physicians refer their patients to Shady Grove Fertility each year. For more information, call 1-888-761-1967 or visit ShadyGroveFertility.com.